Hiking Santa Fe is more interesting with us. Have fun in the New Mexico outdoors with Outspire! Your own private hiking guide is waiting to show you the Land of Enchantment in ways that guidebooks cannot. Public lands near Santa Fe protect a spectacular variety of environments ranging from arid canyons and volcanic plateaus to subalpine forests and meadows. Fascinating archaeological sites from the days of the Ancestral Puebloans add to this treasure. Hiking opportunities abound. If you'd like to include a hike during your visit to Santa Fe, Outspire Hiking will help you choose an outing appropriate to your interests, your physical abilities, and your travel schedule. You'll be hiking in the company of your own personal guide who will help you gain a sense of where your destination fits into New Mexico's rich natural and cultural history. Whether you're an experienced hiker or a first-timer, you can enjoy an outing with us. Tours can be leisurely interpretive walks or energetic trekking, from 2 hours to 6 hours or more on trail. Solo travelers are welcome. Reservations are required in advance so we may prepare for your special trip. We'll provide a day pack for you to use, rain poncho, adjustable trekking poles, bottled water and trail snacks. Snowshoe trips include fitted snowshoes, poles and leg gaiters for your comfort. Guides have special first aid training, carry extra supplies, and look out for your comfort and safety during your hike. We can meet you at your downtown Santa Fe hotel or other nearby location. Since we keep track of New Mexico's weather forecasts, trail conditions, and seasonal items of interest, we can tell you what to expect, what you might like to bring from home, and help you better enjoy your time outdoors around Santa Fe. 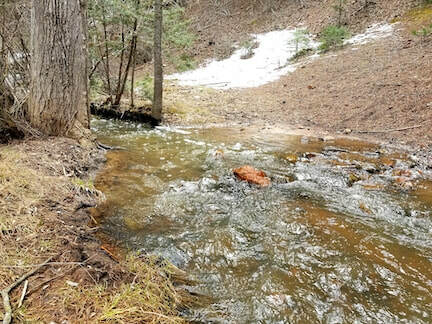 There's still a deep base of snow above 10,000' in the Sangre de Cristo Mountains east of Santa Fe, but the annual Spring thaw has ended snowshoeing for the season. High elevation trails are either icy, muddy, or mired in sticky snow, so this is the month we look to the west. Hiking is good on lower elevation trails along the Rio Grande and Chama River canyons. We do have to be prepared an occasional cold or blustery day. April weather in the Rockies is notoriously fickle. The federal parks Bandelier National Monument, Pecos National Historical Park, and Kasha-Katuwe Tent Rocks National Monument are all open and make excellent destinations in April. 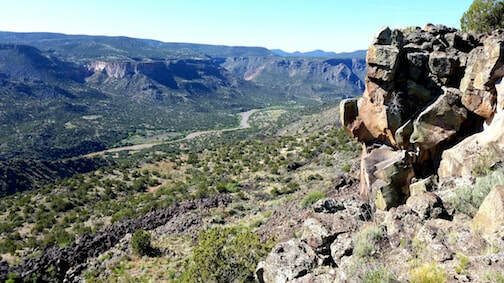 New Mexico offers miles of trails and a diversity of terrain. Day hikes can be enjoyed year-round although different places are more enjoyable in each season. Since all our trips are customized for you, we'll talk with you about what you might find most interesting, your schedule, and your abilities to help pick just the right place to spend time with you! Alpine: The Sangre de Cristo Mountains rise above Santa Fe on the east and the Jemez Mountains stand across the wide valley to our west. Cool shady trails into the forest are best from late spring to fall, or on snowshoes during winter. Mesas and canyons: Spectacular vistas, sculptural rock formations and incredible colors are hallmarks of these slightly lower elevation areas. White Rock Canyon and Tsankawi Mesa are perfect examples. Best visited fall through spring, or early morning during summer. Special tours: Some places are just so special they deserve their own category. Bandelier National Monument, with its deep canyons and cliff dwellings, the rim of the Valles Caldera National Preserve and its fantastic volcanic past, Ghost Ranch near Abiquiu with it's sandstone mesas made famous by Georgia O'Keeffe, and the forested plateaus of the Pecos Wilderness fall into this category for us. All our tours are hikes, but the ones to these places can be milder (or wilder). As a professional guide service, Outspire Hiking and Snowshoeing is approved and permitted by the USDA-Forest Service, Bureau of Land Management, and U.S. Park Service. We are an equal opportunity service provider. Come hiking with Outspire--because sometimes the best inspiration comes from being outside!